The Rt Hon the Lord Paul of Marylebone, PC, Chairman of Caparo Group, is a leading businessman and an active member of the House of Lords where he was Deputy Speaker from 2008-2010. 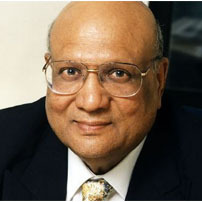 Born in Jalandhar, India in 1931, he went to the UK in 1966 and in 1968 founded Caparo Group, the UK based industrial company employing 7,000 people with operations in Europe, Asia and North America. He was raised to the Peerage as Baron Paul of Marylebone in August 1996 and in July 2009 was appointed by H.M. the Queen as a member of her Privy Council. Lord Paul was member of the London Development Agency from 2000-2008 and from 2005-2008 chaired the LDA Olympics Delivery Committee which was responsible for delivering the land and infrastructure for the London 2012 Olympic Games on time and on budget. He was also on the board of London 2012 and a member of the British Olympic Association Advisory Board. He was a Member of Panel 2000, an appointment by the Prime Minister to re-brand Britain 1997 – 2010. He was also a member of the Industrial Development Advisory Board (a Department of Trade and Industry appointment) 1999 – 2005. He was an Ambassador for British Business, a UK government initiative, from 1997 to 2005 representing UK trade and investment on 75 occasions in 30 different countries. Lord Paul is currently Vice-Chair of the All Party Parliamentary Group on Anti-Corruption. He has been Chancellor of the University of Wolverhampton since 1999 and was Chancellor of the University of Westminster from 2006 to 2014. Lord Paul holds 15 honorary degrees in recognition of his contributions to business, the economy and his social and charitable works. He was awarded the Padma Bhushan by the Government of India in 1983 and granted the Freedom of the City of London in 1998.